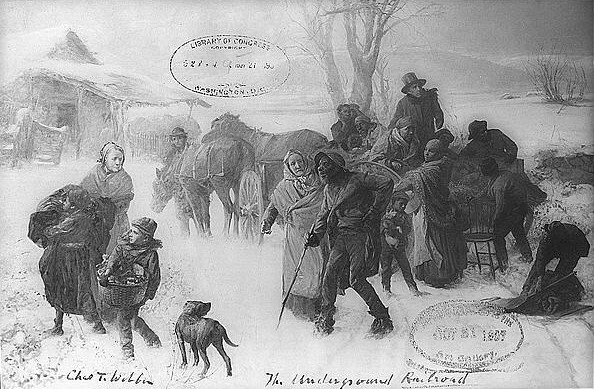 The Underground Railroad was very active in Southeast Ohio. Many Quaker families, and others in the community, courageously hid and conducted freedom seekers on toward Canada. Stratton relatives were involved in this endeavor. However, they spoke little about it -- this being a private act of conscience. Also, they dared not write about their "work" in letters or diaries -- so few family accounts have survived. However, see John Salisbury Cochran's account (Parts 10-16) about the Quaker miller, Joshua Cope, who was much involved in the underground railroad. Joshua Cope conducted slaves from Wheeling, Virginia, across the Ohio River, and hid them at his flour mill, which was near Colerain, Ohio -- about seven miles from Stratton House Inn. For additional information on this website about the abolitionist movement and the underground railroad in southeast Ohio, please start with the following entries and resources. 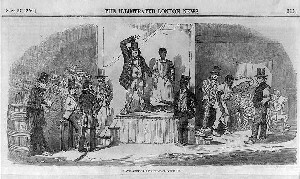 Benjamin Lundy: The Father of Abolitionism. The Quaker, Lundy, started the abolitionist movement in St. Clairsville, Ohio, which is near Stratton House Inn. Just a short walk up the hill from Stratton House Inn, this is a good place to start your exploration of the underground railroad in southeast Ohio. Virtually the entire town of Mount Pleasant, Ohio, was involved in the abolitionist movement and the underground railroad. It is a short drive from Stratton House Inn, and is well worth the trip. Franklin College was a "hot bed" of abolitionist sentiment. From Stratton House Inn, you go through New Athens on your way to Mount Pleasant. Plan to spend a day exploring these resources. Captions: Top: A photo of Charles T. Webber's painting of the Underground Railroad in winter. It is owned by the Cincinnati Art Museum. 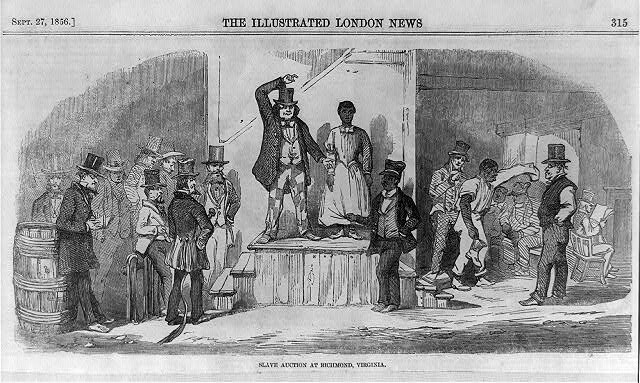 Bottom: This 1856 Illustrated London News engraving depicts the slave auction in Richmond, Virginia, which closely resembled the slave auction block in Wheeling. Click images for larger versions.